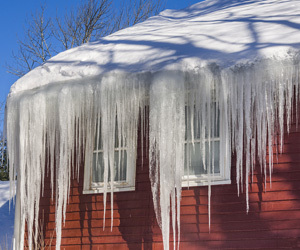 Icicles hanging from your roof can signal a problem. This can be a sign of ice dams. When your home has ice dams it is usually a result of inadequate insulation. Ice dams can be caused by a variety of factors: attic heat loss, inferior roof design, poor attic ventilation and more. Reducing the risk of ice dams involves three steps: sealing air leaks, good attic ventilation and proper insulation. The majority of your home’s heat loss occurs through the attic. It is estimated that this heat loss may be as high as 60%. Most of this heat loss is through air leaks between the living area and attic floor. Sealing attic air leaks can help keep warm air in the living space, maintain a lower temperature in the attic and reduce the likelihood of ice forming along the roof’s edge. Proper attic ventilation helps facilitate airflow throughout the attic space. Attic ventilation helps prevent moisture buildup and allows insulation to perform at an optimal level. When the attic system works properly, there is a lower risk for ice dams. A properly insulated attic creates a thermal barrier adequate for your climate zone. This helps keep heated air inside your home. Blown-in fiberglass insulation is an efficient way to create a complete thermal blanket. Taking the necessary steps to prevent ice dams can avoid a headache for the homeowner and create a more efficient home. Hire a professional insulation contractor to ensure your next project has proper insulation, air sealing and ventilation. To discuss your next project, contact our office. © 2019 DeVere Insulation. All Rights Reserved.